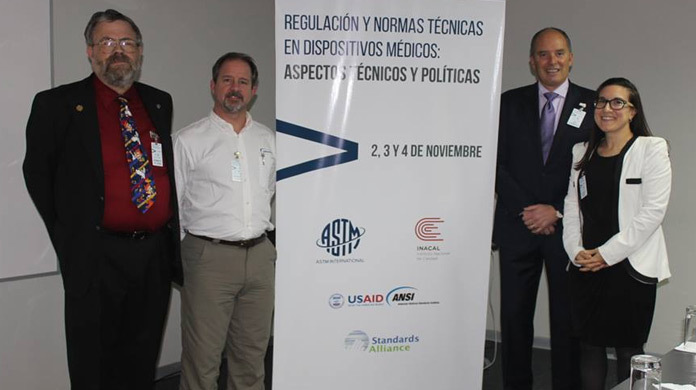 In conjunction with INACAL and ASTM International, the Standards Alliance organized a three day workshop on November 2-4, 2015 workshop in Lima, Peru. 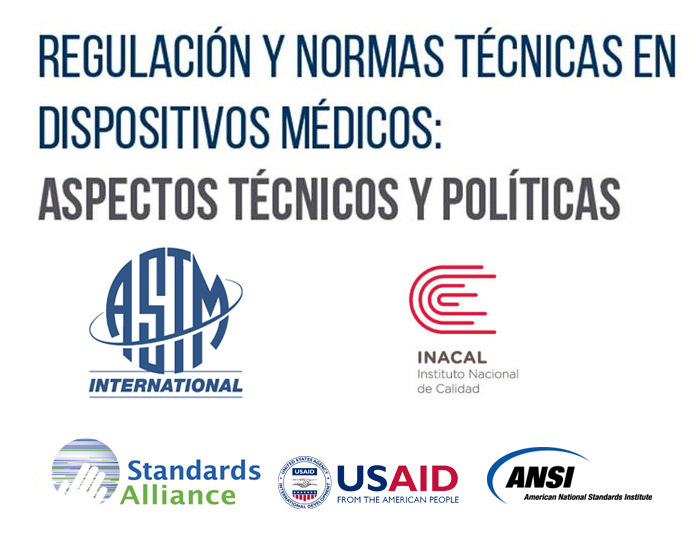 The workshop focused on the components of Good Regulatory Practice in Healthcare, Overview of Committee and Technical Training-Biocompatibility Test Methods, and Technical Training on Cardiovascular Materials or Device Aspects. 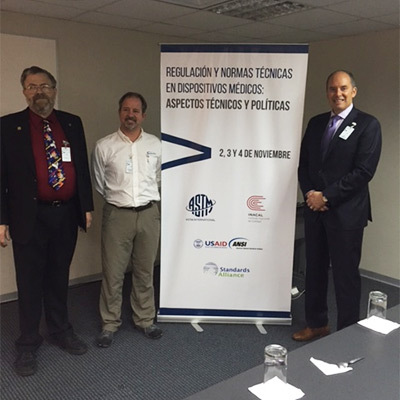 Representatives from ASTM International, AstraZeneca, U.S. Office of Management and Budget (OMB-OIRA), and ANSI shared U.S. perspective. The Peruvian viewpoints were represented and shared by National Institute of Quality (INACAL), Medicines, Supplies and Drugs (DIGEMID), Ministry of Foreign Trade and Tourism (MINCETUR), Tagumedica Co. SA, National Center of Quality Control (CNCC), National Institute of Health (INS), and Supervisory Body of the State Peru representative (OSCE). 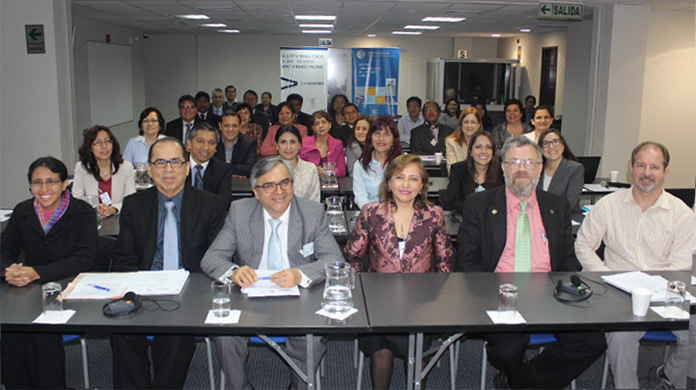 The workshop was attended by 45 Peruvian participants from both the public and private sector. Quantitative outputs from the meeting include 14 new ASTM membership applications for the ASTM committees including F04 on Medical Devices. Dr. St. John is Associate Professor of Biomedical Materials Science and Associate Professor of Orthopedics and Rehabilitation at the University of Mississippi Medical Center in Jackson, MS, USA. Before pursuing his doctoral studies, Dr. St. John worked in a contract laboratory helping to develop new contraceptive and wound healing pharmaceutical solutions under contract from the US National Institutes of Health. He then worked for ten years in research and product development for a small orthopedic device company working on ligament repair and composite hip prosthesis development. After joining the faculty at the University of Mississippi Medical Center in 1989, he also began his doctoral studies at Mississippi State University, investigating the wear properties of hip replacement devices and the tissue response to wear particles generated from these devices. His research at UMMC has involved the wear of hip prostheses and motion-sparing spinal prostheses, as well as evaluation of spinal prostheses that have been removed from patients during new product clinical trials. Dr. St. John has been a member of ASTM Committee F04 on Medical and Surgical Materials and Devices since 1980 and has been chairman of subcommittee F04.16 on Biocompatibility Test Methods since 1986. He received the Award of Merit from ASTM International in 2012 and the honorary title of Fellow of ASTM. Nathan Frey is a senior policy analyst at the U.S. Office of Management and Budget’s Office of Information and Regulatory Affairs. He manages executive branch oversight of federal regulatory actions. Nathan has served in both the Bush and Obama Administrations, providing analysis to senior White House policy officials to ensure that federal regulatory policies are consistent with Administration priorities. 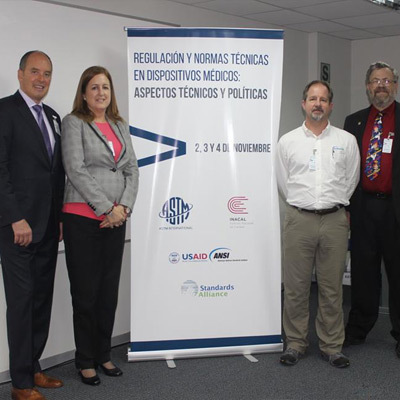 Nathan leads U.S. bilateral regulatory cooperation efforts with Mexico through the High Level Regulatory Cooperation Council and serves as an expert consultant to APEC and OECD initiatives promoting good regulatory practices in Latin America. Prior to his service at OIRA, Nathan worked as a consultant to the InterAmerican Development Bank in Central America. He holds a Bachelor of Arts in International Affairs and a Master of Arts in Law and Diplomacy from the Fletcher School at Tufts University. Jon Cammack is the Global Vice President of R&D/Clinical Quality for AstraZeneca’s biotech businesses (MedImmune). In this role, Jon has strategic oversight for all biologics development Quality operations, including combination products and Biosimilars. He interfaces with executive company leadership to achieve patient-safe product commercialization and meet regulatory and compliance goals. Jon has over 20 years of experience in medical product development, including leadership roles at Baxter, Isis, and as a co-founder of a consulting company that specializes in enterprise risk management. Since his election in 2007, Jon has served as the head of the United State’s Delegation for all ISO 10993 medical product testing standards. He also holds advisory board positions at Northwestern University’s Center of Excellence in Nanotechnology Cancer Research, and the Biotechnology program at the University of Illinois Medical School. Jon holds a B.S. in Chemistry, and a Ph.D. in Pharmacology. Dr. Perry is an expert in the mechanics of materials and implantable medical device engineering. He assists companies through all stages of the product process including concept, development, testing, materials, manufacturing, engineering and regulatory approval. Dr. Perry has a strong reputation for using experiments and finite element analysis to optimize implant performance and reliability. He is a member of the Society for Experimental Mechanics, American Society of Mechanical Engineers and the American Society for Testing and Materials and has authored numerous technical publications on mechanics, materials, imaging, measurement and medical devices. For ASTM, Dr. Perry has actively participated on task groups and initiatives within F04.30 on Cardiovascular Standards for the last 15 years and E08 on Fatigue and Fracture for the last 20. Armaulía Sánchez Manuel Arturo TagumedicaS.A. Cabezas Quispe Ruth Lourdes Johnson& Johnson del Peru S.A.
Choque Morón Marlene HospiraPeru S.R.L. Espinoza SanMartín Zaida Paola TagumedicaS.A. Llaja deMelly Martha Yolanda IndustriasAlgotec S.A.
Olivares León Juan Gerardo SiemensS.A.C. Passuni Rojas Jaime J.PASSUNI & Cia. S.A.C. Valencia Anglas Elizabeth AtilioPalmieri S.R.L. Zelaya Vargas Ana Johnson& Johnson del Peru S.A.